"Move On" is the title of a major two-year three-continent media arts initiative organized by EMARE (European Media Art Residency Exchange), the Goethe-Institut and multiple arts institutions around the world. Taking stock after two thirds of the artist residency program has been realized, the Goethe-Institut Toronto hosted a media arts sidebar at the Visible Evidence 22 conference on documentary media. Over an afternoon of discussions on multi-national residencies, international artists, curators and presenters reflected on their experiences with "Move On." Incepted by the European Media Art Network in partnership with the Goethe-Institut and partners in Australia and Canada and supported by the European Commission Culture Programme, 19 artist residencies have created new work in Australia, Canada, England, Germany, France and the Netherlands in 2014-15.FACT Liverpool director Mike Stubbs reported back on what he took away from the Toronto conference. Bringing together some of the participants in this year’s EMARE (European Media Art Residency Exchange) program provided an opportunity to share with a public audience the trials and tribulations of international artists’ residencies in general and the massive success of EMARE itself. Peter Zorn told us the history and original intention from his initial impetus twenty years previously. We learned of the necessity to connect the isolated Werkleitz Gessellschaft, in the Sachsen Anhalt region with other international organisations and artists working with moving image and technology. Sofa surfing, parties and techno positivism featured in the early days. It was clear that the personal drive, commitment and trust between partners enabled its continuation and growth, even when funding was tight or non-existent. Word of mouth spread its reputation, clearly demonstrating for the interest and need for artists to have new opportunities. An interest in high-speed connectivity (ISDN) and the innovation of non-linear editing also fuelled one of the first partnerships between Werkleitz and Hull Time Based Arts. A great collaboration evolved, a through a trusted network steadily leading to a framework with criteria, guidelines and quality to emerge as one of the world’s longest running and internationally spread residency exchange programs, across a network of many countries, hosting more than 150 residencies in total. Peter’s presentation indicated the flow of organisations dipping in and out as the program as they could afford, and the development of partnerships with non-European organisations in recent years. This expansion enabled with the support of the EU, and including organisations such as CMM, Mexico City, Experimenta, Melbourne, Oboro, Montreal and Images Festival, Toronto. 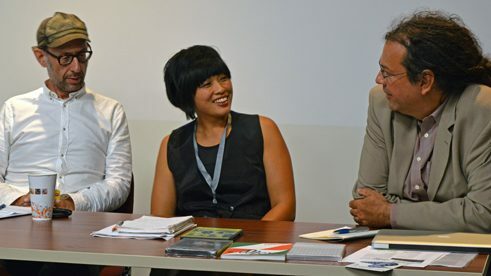 Heather Keung, the new Director of Images, raised important points on how best to take the responsibility and duty of care for ‘foreign’ sometimes younger artists spending two months in one’s own city. What does it mean to be a good host, how to quickly loop people into a scene, whilst recognising that artists also naturally build bridges and connect with others in the community. We also noted caution in assessing the impact of residencies on our own organisations and staff, especially those with smaller teams. And what happens when stuff goes wrong. We learned of the incredible opportunity to co-produce and commission new work by new artists and the internationalism this brings. Daniel Cockburn reflected on how his immediate personal circumstances had influenced his need for a more solitary experience when resident with Impakt in Utrecht and how the people there had been sensitive to that. Mathias Jud gave us an overview of a new project made in residence with his collaborator Christopher Wachtler at QUT in Brisbane, one that had challenged many aspects of the host, technically and politically. Mathias shared his experience of negotiating Australian law on migration and how to gain access to detention centres (BITA outside Brisbane). This formed part of the process to establish relationships with detainees, who would in turn would be connected in real time to visitors to the final exhibition at the Block at QUT. An exceptional project which seemed to totally capture the audiences imaginations, through our ability to hear directly from detainees via telephony. Making the work, involved learning protocols and some basic (if hidden) law permitting detainees to receive visitors, art as process as much product. Juxtaposing the plight of those waiting for residency is of course equally mirrored in our current situation of the mass movement of peoples escaping war zones. Surely these real world situations prove the real value of artists pioneering cultural exchange and the increasing necessity of a borderless world. Mobility, acceptance of others, learning to be a good host and reciprocation through being a good guest are all featured the true value of a residency exchange to create situations for artists to take risks and for us to remember the incredible agency and affect artists create outside of our normal circles and communities. If you are interested to see the final results of the residencies join us in Halle, Germany for the Move On Festival, 9-11th October, including a survey show of the MOVE ON projects and a closing conference. Mike Stubbs is the Director FACT Liverpool (a current partner within EMARE) and took part in some of the first residency exchange programs, between Hull and Werkleitz as artist and curator.